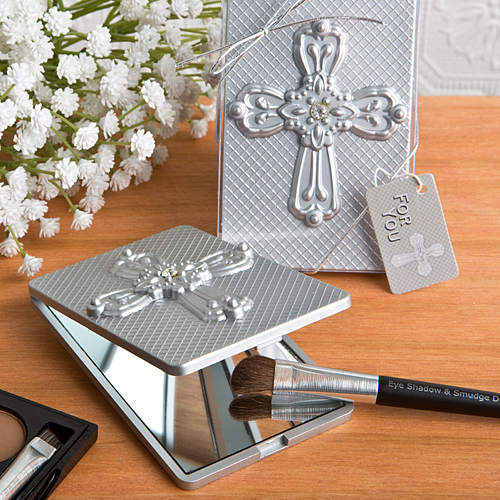 Give truly functional gifts with these cross compact mirror favors. Used for a variety of Christian occasions, like a baptism, christening, or communion, these rectangular mirrors can be placed in a purse or pocket. Open this lovely compact and you will find a regular as well as a magnifying mirror. Each mirror has a silver finish, with a cross showing a rhinestone in the center and is made from made from molded plastic. Measuring 3 1/2" x 2 1/4", each mirror is housed in a clear display box with a silver bow and tag.